For other uses, see Henry George (disambiguation). Henry George (September 2, 1839 – October 29, 1897) was an American political economist and journalist. His writing was immensely popular in the 19th century, and sparked several reform movements of the Progressive Era. His writings also inspired the economic philosophy known as Georgism, based on the belief that people should own the value they produce themselves, but that the economic value derived from land (including natural resources) should belong equally to all members of society. His most famous work, Progress and Poverty (1879), sold millions of copies worldwide, probably more than any other American book before that time. The treatise investigates the paradox of increasing inequality and poverty amid economic and technological progress, the cyclic nature of industrialized economies, and the use of rent capture such as land value tax and other anti-monopoly reforms as a remedy for these and other social problems. The mid-twentieth century labor economist and journalist George Soule wrote that George was "By far the most famous American economic writer," and "author of a book which probably had a larger world-wide circulation than any other work on economics ever written." George was born in Philadelphia to a lower-middle-class family, the second of ten children of Richard S. H. George and Catharine Pratt George (née Vallance). His father was a publisher of religious texts and a devout Episcopalian, and sent George to the Episcopal Academy in Philadelphia. George chafed at his religious upbringing and left the academy without graduating. Instead he convinced his father to hire a tutor and supplemented this with avid reading and attending lectures at the Franklin institute. His formal education ended at age 14 and he went to sea as a foremast boy at age 15 in April 1855 on the Hindoo, bound for Melbourne and Calcutta. He ended up in the American West in 1858 and briefly considered prospecting for gold but instead started work the same year in San Francisco as a type setter. In California, George fell in love with Annie Corsina Fox, an eighteen-year-old girl from Sydney who had been orphaned and was living with an uncle. The uncle, a prosperous, strong-minded man, was opposed to his niece's impoverished suitor. But the couple, defying him, eloped and married in late 1861, with Henry dressed in a borrowed suit and Annie bringing only a packet of books. The marriage was a happy one and four children were born to them. On November 3, 1862 Annie gave birth to future United States Representative from New York, Henry George Jr. (1862–1916). Early on, even with the birth of future sculptor Richard F. George (1865 – September 28, 1912), the family was near starvation. George was raised as an Episcopalian, but he believed in "deistic humanitarianism". Fox was Irish Catholic, but Henry George Jr. wrote that the children were mainly influenced by Henry George's deism and humanism. After deciding against gold mining in British Columbia, George was hired as a printer for the newly created San Francisco Times, and was able to immediately submit editorials for publication, including the popular What the Railroads Will Bring Us., which remained required reading in California schools for decades. George climbed the ranks of the Times, eventually becoming managing editor in the summer of 1867. George worked for several papers, including four years (1871–1875) as editor of his own newspaper San Francisco Daily Evening Post and for a time running the Reporter, a Democratic anti-monopoly publication. The George family struggled but George's increasing reputation and involvement in the newspaper industry lifted them from poverty. George's other two children were both daughters. The first was Jennie George, (c. 1867–1897), later to become Jennie George Atkinson. George's other daughter was Anna Angela George (b. 1878), who would become mother of both future dancer and choreographer, Agnes de Mille and future actress Peggy George, who was born Margaret George de Mille. George began as a Lincoln Republican, but then became a Democrat. He was a strong critic of railroad and mining interests, corrupt politicians, land speculators, and labor contractors. He first articulated his views in an 1868 article entitled "What the Railroad Will Bring Us." George argued that the boom in railroad construction would benefit only the lucky few who owned interests in the railroads and other related enterprises, while throwing the greater part of the population into abject poverty. This had led to him earning the enmity of the Central Pacific Railroad's executives, who helped defeat his bid for election to the California State Assembly. I asked a passing teamster, for want of something better to say, what land was worth there. He pointed to some cows grazing so far off that they looked like mice, and said, "I don't know exactly, but there is a man over there who will sell some land for a thousand dollars an acre." Like a flash it came over me that there was the reason of advancing poverty with advancing wealth. With the growth of population, land grows in value, and the men who work it must pay more for the privilege. Furthermore, on a visit to New York City, he was struck by the apparent paradox that the poor in that long-established city were much worse off than the poor in less developed California. These observations supplied the theme and title for his 1879 book Progress and Poverty, which was a great success, selling over 3 million copies. In it George made the argument that a sizeable portion of the wealth created by social and technological advances in a free market economy is possessed by land owners and monopolists via economic rents, and that this concentration of unearned wealth is the main cause of poverty. George considered it a great injustice that private profit was being earned from restricting access to natural resources while productive activity was burdened with heavy taxes, and indicated that such a system was equivalent to slavery—a concept somewhat similar to wage slavery. This is also the work in which he made the case for a land value tax in which governments would tax the value of the land itself, thus preventing private interests from profiting upon its mere possession, but allowing the value of all improvements made to that land to remain with investors. George was in a position to discover this pattern, having experienced poverty himself, knowing many different societies from his travels, and living in California at a time of rapid growth. In particular he had noticed that the construction of railroads in California was increasing land values and rents as fast as or faster than wages were rising. In 1880, now a popular writer and speaker, George moved to New York City, becoming closely allied with the Irish nationalist community despite being of English ancestry. From there he made several speaking journeys abroad to places such as Ireland and Scotland where access to land was (and still is) a major political issue. In 1886, George campaigned for mayor of New York City as the candidate of the United Labor Party, the short-lived political society of the Central Labor Union. He polled second, more than the Republican candidate Theodore Roosevelt. The election was won by Tammany Hall candidate Abram Stevens Hewitt by what many of George's supporters believed was fraud. In the 1887 New York state elections, George came in a distant third in the election for Secretary of State of New York. The United Labor Party was soon weakened by internal divisions: the management was essentially Georgist, but as a party of organized labor it also included some Marxist members who did not want to distinguish between land and capital, many Catholic members who were discouraged by the excommunication of Father Edward McGlynn, and many who disagreed with George's free trade policy. George had particular trouble with Terrence V. Powderly, president of the Knights of Labor, a key member of the United Labor coalition. While initially friendly with Powderly, George vigorously opposed the tariff policies which Powderly and many other labor leaders thought vital to the protection of American workers. George's strident criticism of the tariff set him against Powderly and others in the labor movement. George's first stroke occurred in 1890, after a global speaking tour concerning land rights and the relationship between rent and poverty. This stroke greatly weakened him, and he never truly recovered. Despite this, George tried to remain active in politics. Against the advice of his doctors, George campaigned for New York City mayor again in 1897, this time as an Independent Democrat, saying, "I will make the race if I die for it." The strain of the campaign precipitated a second stroke, leading to his death four days before the election. An estimated 100,000 people visited Grand Central Palace during the day to see Henry George's face, with an estimated equal number crowding outside, unable to enter, and held back by police. After the Palace doors closed, the Reverend Lyman Abbott, Father Edward McGlynn, Rabbi Gustav Gottheil, R. Heber Newton (Episcopalian), and John Sherwin Crosby delivered addresses. Separate memorial services were held elsewhere. In Chicago, five thousand people waited in line to hear memorial addresses by the former governor of Illinois, John Peter Altgeld, and John Lancaster Spalding. Mayor Strong broke down and cried at a meeting, calling George a martyr. 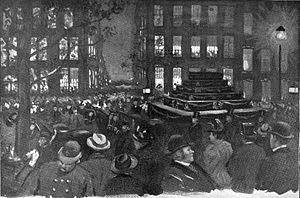 The New York Times reported that later in the evening, an organized funeral procession of about 2,000 people left from the Grand Central Palace and made its way through Manhattan to the Brooklyn Bridge. This procession was "all the way ... thronged on either side by crowds of silent watchers." The procession then went on to Brooklyn, where the crowd at Brooklyn City Hall "was the densest ever seen there." There were "thousands on thousands" at City Hall who were so far back that they could not see the funeral procession pass. It was impossible to move on any of the nearby streets. The Times wrote, "Rarely has such an enormous crowd turned out in Brooklyn on any occasion," but that nonetheless, "[t]he slow tolling of the City Hall bell and the regular beating of drums were the only sounds that broke the stillness. ... Anything more impressive ... could not be imagined." At Court Street, the casket was transferred to a hearse and taken to a private funeral at Fort Hamilton. Commentators disagreed on whether it was the largest funeral in New York history or the largest since the death of Abraham Lincoln. The New York Times reported, "Not even Lincoln had a more glorious death." Even the more conservative New York Sun wrote that "Since the Civil War, few announcements have been more startling than that of the sudden death of Henry George." Flags were placed at half-mast, even at Tammany Hall, which cancelled its rally for the day. Everybody works but the vacant lot. Henry George is best known for his argument that the economic rent of land (location) should be shared by society. The clearest statement of this view is found in Progress and Poverty: "We must make land common property." By taxing land values, society could recapture the value of its common inheritance, raise wages, improve land use, and eliminate the need for taxes on productive activity. George believed it would remove existing incentives toward land speculation and encourage development, as landlords would not suffer tax penalties for any industry or edifice constructed on their land and could not profit by holding valuable sites vacant. Broadly applying this principle is now commonly known as "Georgism." In George's time, it was known as the "single-tax" movement and sometimes associated with movements for land nationalization, especially in Ireland. However, in Progress and Poverty, George did not favor the idea of nationalization. I do not propose either to purchase or to confiscate private property in land. The first would be unjust; the second, needless. Let the individuals who now hold it still retain, if they want to, possession of what they are pleased to call their land. Let them continue to call it their land. Let them buy and sell, and bequeath and devise it. We may safely leave them the shell, if we take the kernel. It is not necessary to confiscate land; it is only necessary to confiscate rent. George considered businesses relying on exclusive right-of-way land privilege to be "natural" monopolies. Examples of these services included the transportation of utilities (water, electricity, sewage), information (telecommunications), goods, and travelers. George advocated that these systems of transport along "public ways" should usually be managed as public utilities and provided for free or at marginal cost. In some cases, it might be possible to allow competition between private service providers along public "rights of way," such as parcel shipping companies that operate on public roads, but wherever competition would be impossible, George supported complete municipalization. George said that these services would be provided for free because investments in beneficial public goods always tend to increase land values by more than the total cost of those investments. George used the example of urban buildings that provide free vertical transit, paid out of some of the increased value that residents derive from the addition of elevators. George was opposed to or suspicious of all intellectual property privilege, because his classical definition of "land" included "all natural forces and opportunities." Therefore, George proposed to abolish or greatly limit intellectual property privilege. In George's view, owning a monopoly over specific arrangements and interactions of materials, governed by the forces of nature, allowed title-holders to extract royalty-rents from producers, in a way similar to owners of ordinary land titles. George later supported limited copyright, on the ground that temporary property over a unique arrangement of words or colors did not in any way prevent others from laboring to make other works of art. George apparently ranked patent rents as a less significant form of monopoly than the owners of land title deeds, partly because he viewed the owners of locations as "the robber that takes all that is left." People could choose not to buy a specific new product, but they cannot choose to lack a place upon which to stand, so benefits gained for labor through lesser reforms would tend to eventually be captured by owners and financers of location monopoly. George was opposed to tariffs, which were at the time both the major method of protectionist trade policy and an important source of federal revenue, the federal income tax having not yet been introduced. He argued that tariffs kept prices high for consumers, while failing to produce any increase in overall wages. He also believed that tariffs protected monopolistic companies from competition, thus augmenting their power. Free trade became a major issue in federal politics and his book Protection or Free Trade was the first book to be read entirely into the Congressional Record. It was read by five Democratic congressmen. In 1997, Spencer MacCallum wrote that Henry George was "undeniably the greatest writer and orator on free trade who ever lived." In 2009, Tyler Cowen wrote that George's 1886 book Protection or Free Trade "remains perhaps the best-argued tract on free trade to this day." Jim Powell said that Protection or Free Trade was probably the best book on trade written by anyone in the Americas, comparing it Adam Smith's Wealth of Nations. Milton Friedman said it was the most rhetorically brilliant work ever written on trade. Friedman also paraphrased one of George's arguments in favor of free trade: "It's a very interesting thing that in times of war, we blockade our enemies in order to prevent them from getting goods from us. In time of peace we do to ourselves by tariffs what we do to our enemy in time of war." George was one of the earliest and most prominent advocates for adoption of the secret ballot in the United States. Harvard historian Jill Lepore asserts that Henry George's advocacy is the reason Americans vote with secret ballots today. George's first article in support of the secret ballot was entitled "Bribery in Elections" and was published in the Overland Review of December 1871. His second article was "Money in Elections," published in the North American Review of March 1883. The first secret ballot reform approved by a state legislature was brought about by reformers who said they were influenced by George. The first state to adopt the secret ballot, also called The Australian Ballot, was Massachusetts in 1888 under the leadership of Richard Henry Dana III. By 1891, more than half the states had adopted it too. George supported the use of "debt free" (sovereign money) currency, such as the greenback, which governments would spend into circulation to help finance public spending through the capture of seigniorage rents. He opposed the use of metallic currency, such as gold or silver, and fiat money created by private commercial banks. George proposed to create a pension and disability system, and an unconditional basic income from surplus land rents. It would be distributed to residents "as a right" instead of as charity. Georgists often refer to this policy as a citizen's dividend in reference to a similar proposal by Thomas Paine. George noted that most debt, though bearing the appearance of genuine capital interest, was not issued for the purpose of creating true capital, but instead as an obligation against rental flows from existing economic privilege. George therefore reasoned that the state should not provide aid to creditors in the form of sheriffs, constables, courts, and prisons to enforce collection on these illegitimate obligations. George did not provide any data to support this view, but in today's developed economies, much of the supply of credit is created to purchase claims on future land rents, rather than to finance the creation of true capital. Michael Hudson and Adair Turner estimate that about 80 percent of credit finances real estate purchases, mostly land. George acknowledged that this policy would limit the banking system but believed that would actually be an economic boon, since the financial sector, in its existing form, was mostly augmenting rent extraction, as opposed to productive investment. "The curse of credit," George wrote, was "... that it expands when there is a tendency to speculation, and sharply contracts just when most needed to assure confidence and prevent industrial waste." George even said that a debt jubilee could remove the accumulation of burdensome obligations without reducing aggregate wealth. George was an important and vocal advocate for women's political rights. He argued for extending suffrage to women and even suggested filling one house of Congress entirely with women: "If we must have two houses of Congress, then by all means let us fill one with women and the other with men." Dramatic reductions in the size of the military. Replacement of contract patronage with the direct employment of government workers, with civil-service protections. Building and maintenance of free mass transportation and libraries. Campaign finance reform and political spending restrictions. Henry George's ideas on politics and economics had enormous influence in his time. His ideas gave rise to the economic philosophy now known as Georgism. However, his influence slowly waned through the 20th century. Nonetheless, it would be difficult to overstate George's impact on turn-of-the-century reform movements and intellectual culture. George's self-published Progress and Poverty was the first popular economics text and one of the most widely printed books ever written. The book's explosive worldwide popularity is often marked as the beginning of the Progressive Era and various political parties, clubs, and charitable organizations around the world were founded on George's ideas. George's message attracts support widely across the political spectrum, including labor union activists, socialists, anarchists, libertarians, reformers, conservatives, and wealthy investors. 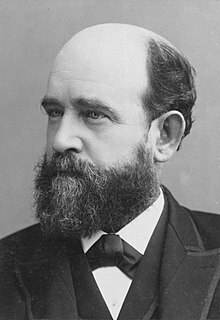 As a result, Henry George is still claimed as a primary intellectual influence by both classical liberals and socialists. Edwin Markham expressed a common sentiment when he said, "Henry George has always been to me one of the supreme heroes of humanity." A large number of famous individuals, particularly Progressive Era figures, claim inspiration from Henry George's ideas. John Peter Altgeld wrote that George "made almost as great an impression on the economic thought of the age as Darwin did on the world of science." Jose Marti wrote, "Only Darwin in the natural sciences has made a mark comparable to George's on social science." In 1892, Alfred Russel Wallace stated that George's Progress and Poverty was "undoubtedly the most remarkable and important book of the present century," implicitly placing it above even The Origin of Species, which he had earlier helped develop and publicize. Franklin D. Roosevelt praised George as "one of the really great thinkers produced by our country" and bemoaned the fact that George's writings were not better known and understood. Yet even several decades earlier, William Jennings Bryan wrote that George's genius had reached the global reading public and that he "was one of the foremost thinkers of the world." John Dewey wrote, "It would require less than the fingers of the two hands to enumerate those who from Plato down rank with him," and that "No man, no graduate of a higher educational institution, has a right to regard himself as an educated man in social thought unless he has some first-hand acquaintance with the theoretical contribution of this great American thinker." 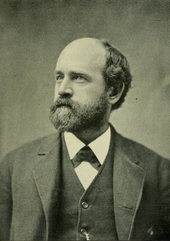 Albert Jay Nock wrote that anyone who rediscovers Henry George will find that "George was one of the first half-dozen [greatest] minds of the nineteenth century, in all the world." The anti-war activist John Haynes Holmes echoed that sentiment by commenting that George was "one of the half-dozen great Americans of the nineteenth century, and one of the outstanding social reformers of all time." Edward McGlynn said, "[George] is one of the greatest geniuses that the world has ever seen, and ... the qualities of his heart fully equal the magnificent gifts of his intellect. ... He is a man who could have towered above all his equals in almost any line of literary or scientific pursuit." Likewise, Leo Tolstoy wrote that George was "one of the greatest men of the 19th century." The social scientist and economist John A. Hobson observed in 1897 that "Henry George may be considered to have exercised a more directly powerful formative and educative influence over English radicalism of the last fifteen years than any other man," and that George "was able to drive an abstract notion, that of economic rent, into the minds of a large number of 'practical' men, and so generate therefrom a social movement. George had all the popular gifts of the American orator and journalist, with something more. Sincerity rang out of every utterance." Many others agree with Hobson. George Bernard Shaw claims that Henry George was responsible for inspiring 5 out of 6 socialist reformers in Britain during the 1880s, who created socialist organizations such as the Fabian Society. The controversial People's Budget and the Land Values (Scotland) Bill were inspired by Henry George and resulted in a constitutional crisis and the Parliament Act 1911 to reform of the House of Lords, which had blocked the land reform. In Denmark, the Danmarks Retsforbund, known in English as the Justice Party or Single-Tax Party, was founded in 1919. The party's platform is based upon the land tax principles of Henry George. The party was elected to parliament for the first time in 1926, and they were moderately successful in the post-war period and managed to join a governing coalition with the Social Democrats and the Social Liberal Party from the years 1957–60, with diminishing success afterwards. Non-political means have also been attempted to further the cause. A number of "Single Tax Colonies" were started, such as Arden, Delaware and Fairhope, Alabama. In 1904, Lizzie Magie created a board game called The Landlord's Game to demonstrate George's theories. This was later turned into the popular board game Monopoly. 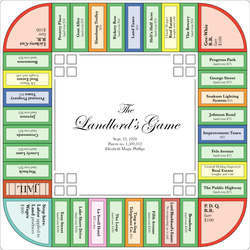 Landlords Game board, based on Magie's 1924 US patent (no. 1,509,312). Joseph Jay "J.J." Pastoriza led a successful Georgist movement in Houston. Though the Georgist club, the Houston Single Tax League, started there in 1890, Pastoriza lent use of his property to the league in 1903. He retired from the printing business in 1906 in order to dedicate his life to public service, then traveled the United States and Europe while studying various systems of taxing property. He returned to Houston and served as Houston Tax Commissioner from 1911 through 1917. He introduced his "Houston Plan of Taxation" in 1912: improvements to land and merchants' inventories were taxed at 25 percent of appraised value, unimproved land was taxed at 70 percent of appraisal, and personal property was exempt. However, in 1915, two courts ruled that the Houston Plan violated the Texas Constitution. Before reading Progress and Poverty, Helen Keller was a socialist who believed that Georgism was a good step in the right direction. She later wrote of finding "in Henry George's philosophy a rare beauty and power of inspiration, and a splendid faith in the essential nobility of human nature." 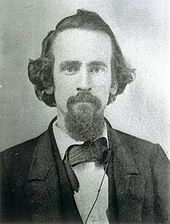 Some speculate that the passion, sincerity, clear explanations evident in Henry George's writing account for the almost religious passion that many believers in George's theories exhibit, and that the promised possibility of creating heaven on Earth filled a spiritual void during an era of secularization. Josiah Wedgwood, the Liberal and later Labour Party politician wrote that ever since reading Henry George's work, "I have known 'that there was a man from God, and his name was Henry George.' I had no need hence-forth for any other faith." Although both advocated worker's rights, Henry George and Karl Marx were antagonists. Marx saw the Single Tax platform as a step backwards from the transition to communism. On his part, Henry George predicted that if Marx's ideas were tried, the likely result would be a dictatorship. Leo Tolstoy deplored that a silence had fallen around George, for he viewed Georgism as reasonable and realistic, as opposed to other utopian movements, and as a "contribution to the enlightenment of the consciousness of mankind, placed on a practical footing," and that it could help do away with what he called the Slavery of Our Times." Henry George's popularity waned gradually during the 20th century. However, there are still Georgist organizations. Many influential people who remain famous, such as George Bernard Shaw, were inspired by George or identify as Georgists. In his last book, Where do we go from here: Chaos or Community?, Martin Luther King, Jr referred to Henry George in support of a guaranteed minimum income. Bill Moyers quoted Henry George in a speech and identified George as a "great personal hero." Albert Einstein wrote that "Men like Henry George are rare unfortunately. One cannot imagine a more beautiful combination of intellectual keenness, artistic form and fervent love of justice. Every line is written as if for our generation. The spreading of these works is a really deserving cause, for our generation especially has many and important things to learn from Henry George." Mason Gaffney, an American economist and a major Georgist critic of neoclassical economics, argued that neoclassical economics was designed and promoted by landowners and their hired economists to divert attention from George's extremely popular philosophy that since land and resources are provided by nature, and their value is given by society, land value—rather than labor or capital—should provide the tax base to fund government and its expenditures. Joseph Stiglitz wrote that "One of the most important but underappreciated ideas in economics is the Henry George principle of taxing the economic rent of land, and more generally, natural resources." Stiglitz also claims that we now know land value tax "is even better than Henry George thought." The Robert Schalkenbach Foundation publishes copies of George's works and related texts on economic reform and sponsors academic research into his policy proposals. The Lincoln Institute of Land Policy was founded to promote the ideas of Henry George but now focuses more generally on land economics and policy. The Henry George School of Social Science of New York and its satellite schools teach classes and conduct outreach. In 1977, Joseph Stiglitz showed that under certain conditions, spending by the government on public goods will increase aggregate land rents by at least an equal amount. This result has been dubbed by economists the Henry George theorem, as it characterizes a situation where Henry George's "single tax" is not only efficient, it is also the only tax necessary to finance public expenditures. George reconciled the issues of efficiency and equity, showing that both could be satisfied under a system in harmony with natural law. He showed that Ricardo's Law of Rent applied not just to an agricultural economy, but even more so to urban economics. And he showed that there is no inherent conflict between labor and capital provided one maintained a clear distinction between classical factors of production, capital and land. George developed what he saw as a crucial feature of his own theory of economics in a critique of an illustration used by Frédéric Bastiat in order to explain the nature of interest and profit. Bastiat had asked his readers to consider James and William, both carpenters. James has built himself a plane, and has lent it to William for a year. Would James be satisfied with the return of an equally good plane a year later? Surely not! He'd expect a board along with it, as interest. The basic idea of a theory of interest is to understand why. Bastiat said that James had given William over that year "the power, inherent in the instrument, to increase the productivity of his labor," and wants compensation for that increased productivity. George did not accept this explanation. He wrote, "I am inclined to think that if all wealth consisted of such things as planes, and all production was such as that of carpenters – that is to say, if wealth consisted but of the inert matter of the universe, and production of working up this inert matter into different shapes – that interest would be but the robbery of industry, and could not long exist." But some wealth is inherently fruitful, like a pair of breeding cattle, or a vat of grape juice soon to ferment into wine. Planes and other sorts of inert matter (and the most lent item of all – money itself) earn interest indirectly, by being part of the same "circle of exchange" with fruitful forms of wealth such as those, so that tying up these forms of wealth over time incurs an opportunity cost. (T)he separation of production into two groups, in one of which the vital forces of nature form a distinct element in addition to labour, while in the other they do not, is entirely untenable... The natural sciences have long ago told us that the cooperation of nature is universal. ... The muscular movement of the man who planes would be of very little use, if the natural powers and properties of the steel edge of the plane did not come to his assistance. The importance ... of this principle – that all production of wealth requires time as well as labor – we shall see later on; but the principle that time is a necessary element in all production we must take into account from the very first. According to Oscar B. Johannsen, "Since the very basis of the Austrian concept of value is subjective, it is apparent that George's understanding of value paralleled theirs. However, he either did not understand or did not appreciate the importance of marginal utility." On the contrary, George explicitly used marginal utility in his analyses of both the 'margin of production' in macroeconomics and microeconomic decision theory. Another spirited response came from British biologist T.H. Huxley in his article "Capital – the Mother of Labour," published in 1890 in the journal The Nineteenth Century. Huxley used the scientific principles of energy to undermine George's theory, arguing that, energetically speaking, labor is unproductive. "The New Party". The North American Review. 145 (368): 1–8. July 1887. ISBN 0-85315-726-X. The Standard, New York 1887 to 1890 A weekly periodical started and usually edited by Henry George. ^ Greenslade, William (2005). Grant Allen : literature and cultural politics at the Fin de Siècle. Aldershot, Hants, England Burlington, VT: Ashgate. ISBN 0754608654. ^ Barnes, Peter (2006). Capitalism 3.0 : a guide to reclaiming the commons. San Francisco Berkeley: Berrett-Koehler U.S. trade Bookstores and wholesalers, Publishers Group West. ISBN 1576753611. ^ Becker, Gary. "Gary Becker Interview". Archived from the original on October 6, 2015. Retrieved October 5, 2015. ^ Contemporary Europe since 1870. Carlton J. H. Hayes. 1953. https://books.google.com/books?id=yCmUjgEACAAJ Quote: "A young Welsh Liberal, David Lloyd George, was especially impressed by Henry George." ^ Stone, Tanya Lee (2018). Pass go and collect $200: the real story of how Monopoly was invented (1st ed.). New York: Henry Holt and Company. ISBN 9781627791687. ^ Mace, Elisabeth. "The economic thinking of Jose Marti: Legacy foundation for the integration of America". Archived from the original on September 8, 2015. Retrieved August 5, 2015. ^ Nearing, The Making of a Radical, pg. 29. ^ Putz, Paul Emory. "Summer Book List: Henry George (and George Norris) and the Crisis of Inequality". Retrieved July 2, 2015. ^ McNab, John (1972). Towards a Theology of Social Concern: A Comparative Study of the Elements for Social Concern in the Writings of Frederick D. Maurice and Walter Rauschenbusch (PhD thesis). Montreal: McGill University. p. 201. Retrieved February 6, 2019. ^ Evans, Christopher H. (2005). "Rauschenbusch, Walter (1861–1918)". In Shook, John R. (ed.). The Dictionary of Modern American Philosophers. 4. Bristol, England: Thoemmes Continuum. p. 2010. ISBN 978-1-84371-037-0. ^ Piott, Steven L. (2006). American Reformers, 1870–1920: Progressives in Word and Deed. Lanham, Maryland: Rowman & Litlefield Publishers. p. 78. ISBN 978-0-7425-2763-8. ^ Soule, George. Ideas of the Great Economists. New English Library, 1979. ^ Dictionary of American Biography, 1st. ed., s.v. "George, Henry," edited by Allen Johnson and Dumas Malone, Vol. VII (New York: Charles Scribner's Sons, 1931), pp. 211–212. ^ a b "American National Biography Online." ^ "How Henry George, Jr., Got into the Catholic "Who's Who"". The Fortnightly Review. 18: 704. 1911. Retrieved March 9, 2018. ^ Formaini, Robert L. "Henry George Antiprotectionist Giant of American Economics" (PDF). Economic Insights of the Federal Reserve Bank of Dallas. 10 (2). Retrieved October 28, 2014. ^ George, Henry. "What the Railroad Will Bring Us [Volume 1, Issue 4, Oct 1868; pp. 297-306]". Overland monthly and Out West magazine. ^ Henry, George, Jr. The Life of Henry George. New York: Doubleday & McClure, 1900, chap. 11. ^ "George, Henry". Encyclopedia.com. International Encyclopedia of the Social Sciences. Retrieved October 28, 2014. ^ Charles A. Barker, "Henry George and the California Background of Progress and Poverty," California Historical Society Quartery 24, no. 2 (Jun. 1945), 103–104. ^ Dictionary of American Biography, s.v. "George, Henry," pp. 211–212. ^ a b c Montgomery, American National Biography Online, s.v. "George, Henry," http://www.anb.org/articles/15/15-00261.html Accessed September 3, 2011. ^ "Obituary – The New York Times, May 4, 1897" (PDF). ^ De Mille, Agnes. "Finding aid to the Agnes De Mille papers SSC.MS.00046". asteria.fivecolleges.edu. ^ a b Henry George, "What the Railroad Will Bring Us," Overland Monthly 1, no. 4 (Oct. 1868), http://www.grundskyld.dk/1-railway.html Archived April 26, 2012, at the Wayback Machine Accessed September 3, 2011. ^ Dictionary of American Biography, s.v. "George, Henry," 213. ^ Henry George, Progress and Poverty, (1879; reprinted, London: Kegan Paul, Tench & Co., 1886), 283–284. ^ Charles A. Barker, "Henry George and the California Background of Progress and Poverty," California Historical Society Quartery 24, no. 2 (Jun. 1945), 97–115. ^ Dictionary of American Biography, s.v. "George, Henry," 214–215. ^ Robert E. Weir, "A Fragile Alliance: Henry George and the Knights of Labor," American Journal of Economics and Sociology 56, no. 4 (Oct. 1997), 423–426. ^ Dictionary of American Biography, s. V. "George, Henry," 215. ^ "Henry George's Death Abroad. London Papers Publish Long Sketches and Comment on His Career". New York Times. October 30, 1897. Retrieved March 7, 2010. The newspapers today are devoting much attention to the death of Henry George, the candidate of the Jeffersonian Democracy for the office of Mayor of Greater New York, publishing long sketches of his career and philosophical and economical theories. ^ Gabriel, Ralph (1946). Course of American democratic thought. p. 204. ^ Yardley, Edmund (1905). Addresses at the funeral of Henry George, Sunday, October 31, 1897. Chicago: The Public publishing company. Retrieved September 7, 2015. ^ "The Funeral Procession" (PDF). The New York Times. November 1, 1897. Retrieved July 16, 2015. ^ a b Lepore, Jill. "Forget 9-9-9. Here's a Simple Plan: 1". The New York Times. Retrieved September 7, 2015. ^ Henry George, Citizen of the World. By Anna George de Mille. Edited by Don C. Shoemaker. With an Introduction by Agnes de Mille. Chapel Hill: The University of North Carolina Press, 1950. ^ George, Henry (1879). "The True Remedy". Progress and Poverty: An Inquiry into the Cause of Industrial Depressions and of Increase of Want with Increase of Wealth. VI. New York: Robert Schalkenbach Foundation. ISBN 0-914016-60-1. Retrieved May 12, 2008. ^ Lough, Alexandra. "The Last Tax: Henry George and the Social Politics of Land Reform in the Gilded Age and Progressive Era". Academia.edu. 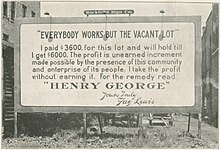 George only sought to make land common property through the socialization of land rent, or what many have called the "unearned increment" of land value. ^ Backhaus, "Henry George's Ingenious Tax," 453–458. ^ "Supplement to Encyclopædia Britannica". 1889. The labor vote in the election was trifling until Henry George had commenced an agitation for the nationalization of land. ^ "The American: A National Journal, Volumes 15-16". 1888. ^ "A RECEPTION TO MR.GEORGE". The New York Times. October 21, 1882. Mr. George expressed his thanks for the reception and predicted that soon the movement in favor of land nationalization would be felt all over the civilized world. ^ George, Henry (1879). "How Equal Rights to the Land May Be Asserted and Secured". Progress and Poverty: An Inquiry into the Cause of Industrial Depressions and of Increase of Want with Increase of Wealth. VIII. New York: Robert Schalkenbach Foundation. ISBN 0-914016-60-1. Retrieved November 27, 2016. ^ Armstrong, K. L. (1895). The Little Statesman: A Middle-of-the-road Manual for American Voters. Schulte Publishing Company. pp. 125–127. Retrieved January 15, 2016. ^ George, Henry (October 6, 1886). 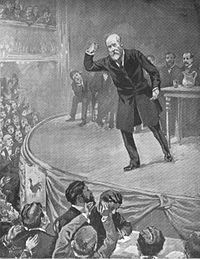 "Throwing His Hat in the Ring: Henry George Runs for Mayor (Acceptance Speech)". New York World, New York Tribune, New York Star, and New York Times. Retrieved February 1, 2016. ^ George, Henry (2016). The annotated works of Henry George. Madison New Jersey Lanham, Maryland New York, NY: Fairleigh Dickinson University Press The Rowman & Littlefield Publishing Group, Inc., Robert Schalkenbach Foundation. ISBN 1611477018. ^ Henry George, Protection or Free Trade: An Examination of the Tariff Question, with Especial Regard to the Interests of Labor(New York: 1887). ^ MacCallum, Spencer H. (Summer–Fall 1997). "The Alternative Georgist Tradition" (PDF). Fragments. 35. Archived from the original (PDF) on March 4, 2016. Retrieved October 30, 2014. ^ Cowen, Tyler (May 1, 2009). "Anti-Capitalist Rerun". The American Interest. 4 (5). Retrieved November 15, 2014. ^ Powell, Jim (June 11, 2016). "Milton Friedman's Favorite Book on Trade". Wall Street Journal. Retrieved March 17, 2018. ^ Obenhaus, Matthew. "Free Trade Lessons for the Economically Challenged". The Gymnasium. Retrieved March 17, 2018. ^ Lepore, Jill (October 13, 2008). "'Rock, Paper, Scissors: How we used to vote'". New Yorker. New Yorker. ^ Saltman, Roy (2008). The history and politics of voting technology : chads and other scandals. Basingstoke: Palgrave Macmillan. p. 97. ISBN 0230605982. ^ For a more complete discussion of the adoption of the Australian Ballot, see Saltman, Roy G., (2006), The History and Politics of Voting Technology, Palgrave Macmillan, NY, pp. 96–103. ^ Turner, Adair (April 13, 2012). "A new era for monetary policy". Berlin: INET. Retrieved January 15, 2016. ^ Hudson, Michael. "Scenarios for Recovery: How to Write Down the Debts and Restructure the Financial System" (PDF). Archived from the original (PDF) on March 4, 2016. Retrieved January 15, 2016. ^ George, Henry. "Consequences of a Growing National Debt". Retrieved January 15, 2016. ^ George, Henry, and Kenneth C. Wenzer. An Anthology of Henry George's Thought. Rochester, N.Y., USA: University of Rochester Press, 1997. ^ Brechin, Gray (2003). Indestructable By Reason of Beauty: The Beaumanance of a Public Library Building (PDF). Greenwood Press. Retrieved December 23, 2014. ^ Altgeld, John (1899). Live Questions (PDF). Geo. S Bowen & Son. Archived from the original (PDF) on September 24, 2014. Retrieved February 3, 2015. ^ Martí, José (2002). José Martí : selected writings. New York: Penguin Books. ISBN 0142437042. ^ Buder, Stanley. Visionaries and Planners: The Garden City Movement and the Modern Community. New York: Oxford UP, 1990. ^ Fox, Stephen R. "The Amateur Tradition: People and Politics." The American Conservation Movement: John Muir and His Legacy. Madison, WI: U of Wisconsin, 1985. 353. ^ Bryan, William Jennings (October 30, 1897). "William Jennings Bryan: Henry George One of the World's Foremost Thinkers" (PDF). The New York Times. The New York Times. Retrieved December 23, 2014. ^ "John Dewey: An Appreciation of Henry George". www.wealthandwant.com. ^ "Albert Jay Nock -- Henry George: Unorthodox American". www.wealthandwant.com. ^ Sekirin, Peter (2006). Americans in conversation with Tolstoy : selected accounts, 1887–1923. Jefferson, N.C: McFarland. ISBN 078642253X. ^ "Henry George | Encyclopedia.com". www.encyclopedia.com. ^ Hobson, John A. (1897). "The Influence of Henry George in England". The Fortnightly. 68. Retrieved August 15, 2015. ^ Henderson, Archibald. George Bernard Shaw, His Life and Works. London: Hurst and Blackett, 1911. ^ "Wonder Woman at Massey Hall: Helen Keller Spoke to Large Audience Who Were Spellbound". Toronto Star Weekly. January 1914. Retrieved October 31, 2014. ^ "Progress & Poverty". Robert Schalkenbach Fdn..
^ Mulvey, Paul (2002). "The Single-Taxers and the Future of Liberalism, 1906–1914". Journal of Liberal Democrat (34/35 Spring/Summer). Retrieved August 15, 2015. ^ Mulvey, Paul (2010). The Political Life of Josiah C. Wedgwood: Land, Liberty and Empire, 1872–1943. Woodbridge, Suffolk, UK Rochester, NY: Boydell Press. ISBN 0861933087. ^ "Letters: Marx-Engels Correspondence 1881". www.marxists.org. ^ L. Tolstoï. Où est l'issu? (1899) In Les Rayons de l'aube (Dernières études philosophiques). (Tr. J-W Bienstock) Paris; P.-V. Stock Éditeur, 1901, chap. xxiii, pp. 393-411. ^ "Bill Moyers at the Howard Zinn Lecture". YouTube. November 12, 2010. Retrieved July 26, 2012. ^ Gaffney, Mason and Harrison, Fred. The Corruption of Economics. (London: Shepheard-Walwyn (Publishers) Ltd., 1994) ISBN 978-0-85683-244-4 (paperback). ^ "The Mason Gaffney Reader". masongaffneyreader.com. ^ Arnott, Richard J.; Joseph E. Stiglitz (November 1979). "Aggregate Land Rents, Expenditure on Public Goods, and Optimal City Size" (PDF). Quarterly Journal of Economics. 93 (4): 471–500. doi:10.2307/1884466. JSTOR 1884466. ^ Frédéric Bastiat, That Which is Seen, and That Which is Not Seen," 1850. ^ Henry George, Progress and Poverty,, 161. ^ Eugen von Böhm-Bawerk, Capital and Interest: A Critical History of Economic Theory transl. William Smart (London: Macmillan and Co., 1890), 417. ^ Henry George, The Science of Political Economy (New York: Doubleday & McClure Co., 1898), 369–370. ^ Johannsen, Oscar B. Henry George and the Austrian economists. The American Journal of Economics and Sociology (Am. j. econ. sociol.) ISSN 0002-9246. Abstract. ^ "The Science of Political Economy, Part III, Chapter 5". politicaleconomy.org. ^ T.H. Huxley, "Capital – the Mother of Labour: An Economical Problem Discussed from a Physiological Point of View," The Nineteenth Century (Mar. 1890). Wikimedia Commons has media related to Henry George. Henry George (1839–1897). The Concise Encyclopedia of Economics. Library of Economics and Liberty (2nd ed.). Liberty Fund. 2008. The Henry George School, founded 1932. The Economics of Henry George's "Progress and Poverty", by Edgar H. Johnson, 1910.